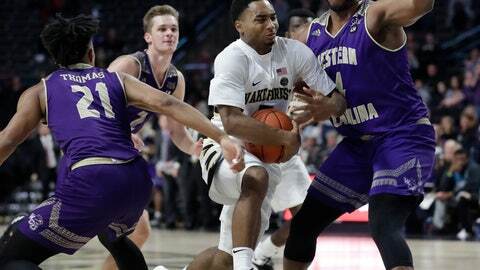 WINSTON-SALEM, N.C. (AP) — Brandon Childress scored 20 points, Jaylen Hoard added 17, and Wake Forest beat Western Carolina 71-64 on Tuesday. The Catamounts‘ upset bid was undone by poor foul shooting (16 of 32) and a trio of turnovers in the final minute. WCU led 63-62 with less than a minute remaining. But Hoard scored while being fouled, and Isaiah Mucius rebounded and put back the missed free throw to give the Demon Deacons a 66-63 lead. “They made winning plays down the stretch that we didn’t make,” Catamounts coach Mark Prosser said. Wake Forest (4-2) jumped out to an early 21-3 lead, with Childress scoring seven of his team’s first 11 points. But WCU quickly ended any notion that the hosts would win comfortably, going on a 14-2 run of its own to pull within 23-17. Wake Forest: It was a win, but Tuesday’s game was a continuation of an inauspicious start to the season for the Demon Deacons, who were picked to finish next-to-last in the Atlantic Coast Conference preseason media poll. With early losses to Saint Joseph’s and Houston Baptist, as well as a close shave against Western Carolina, finding success in the ACC may be a tall task. Despite not playing a single player taller than 6-foot-7, the Catamounts managed to outrebound a lanky Wake Forest roster 37-35. “We should be better,” Demon Deacons coach Danny Manning said succinctly. But Prosser was left to lament one rebound his team could not collect: Hoard’s missed free throw with 51.7 seconds left, when WCU could have taken possession down by only one point. Instead, Mucius grabbed the loose ball and scored.